No Place I’d Rather Be – and no book I’d rather be reading. Cathy Lamb has managed to enthral me again with her far reaching story of strong women who are loads of fun. 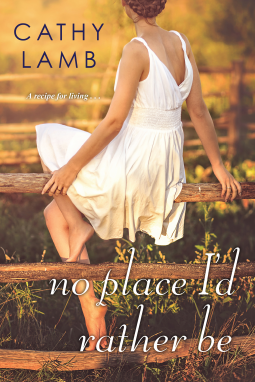 Lamb has a strong, unique voice in all her writing, as Kristy Harvey says in her review “If I was on a deserted island and stumbled across a blank copy of No Place I’d Rather Be with no title, no author page and no distinguishing marks, I would still know it was Cathy Lamb’s. Her voice is totally unique, pitch perfect and utterly charming.” I couldn’t agree more. And I’d know it too. This is a mix of historical and contemporary fiction, both heart warming and heart breaking. Gisela is the great grandmother, a German Jew who was uprooted when the Nazi’s went to work. She lost everyone, but did find a strong Montana man in Oliver Martindale an American airforce officer and a doctor. Together they set up a practice and have one child Mary Beth, who in turn becomes a doctor. She did not find a strong Montana man, her husband abandoned her and left Mary Beth and her daughters Olivia and Chloe. But like Gisela these women have spines of concrete. I so loved them all. Olivia has left her wonderful husband Jace for some reason we don’t know, and it takes quite awhile for that mystery to unfold. I kind of guessed it, but had to wait and see. Jace is amazing and it did break her heart to do it. Olivia has taken on the guardianship of two young girls who need her and she makes a wonderful mother. When she has to return to her home town relationships change, stories unfold and we are introduced to a family I’d love to meet. Chloe, Olivia’s sister has a son – Kyle who has Aspergers. I loved his part in the story and how he was involved, his whole journey. If you are a food lover then this book would definitely appeal from that angle. Much to Mary Beth’s disappointment Olivia did not follow her into the medical field, but rather is a fantastic cook. And the discovery of a family cookbook in the attic is a thread that runs through the book, linking past family to the present. This book has all I could ask for in a book – some history, some humor, some romance, some mystery and suspense, and a huge focus on family and what brings love and happiness. The characters are smart, flawed and totally loveable. Its a big, warmhearted, compassionate feast of a book. I’ll be buying myself a paperback version to reread in future.